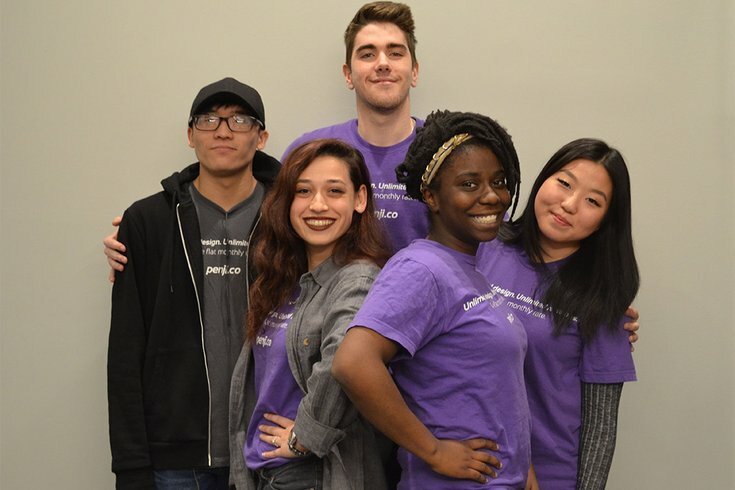 The Penji team includes, from left, Steven Tran, Naciye Cakir, Liam Ely, Sekinah Brodie and Anesis Kim. Penji, a flat-rate graphics design venture in Camden, hopes to hire at least 100 Camden students by the end of the year. Camden’s past depended on making things through heavy manufacturing: metal foundries, shipbuilding, canned soup, early electronics. The city’s future depends on a different kind of making: mental manufacturing, or the fashioning of creative ideas into businesses through technology. And that depends on the city’s recruitment of tech-savvy millennials. Khai Tran and Johnathan Grzybowski are counting on that paradigm shift. The two young men are Rutgers University–Camden grads, intent on building a growing and supportive tech community in the city. Between them, there’s a digital publication aimed at start-ups, a co-working space that has nearly reached capacity, a competition to provide rent-free office space to a start-up proposal and most recently Penji, a flat-rate graphics design venture. Demand for Penji’s services – $349 a month for unlimited services – helped the new business take off, which led to Tran’s purposefully parochial goal: hire at least 100 Camden students by the end of 2019 to learn pieces of the tech business. Penji has five on board now, including animation director Steven Nguyen and graphic designer Anesis Kim, both current Rutgers students, as well as lead designer Liam Ely of Camden County College. Additional future positions will include more designers, project managers and marketing assistants. One newer addition is Sekinah Brodie, who had trouble finding communications work after college and personal challenges, including recovery from a serious car accident. But the 26-year-old found a tech training program at the non-profit Hopeworks ‘N Camden. She used what she learned at Hopeworks to begin her own design and content business, and later joined one of Tran’s ventures as an intern. Now she’s the full-time marketing assistant for Penji. “My experience at Penji has been amazing so far. I'm able to learn a lot about business, become more well-rounded and I'm being challenged every day to become a better person and more critical thinker," she said. The Penji graphic design firm works out of this historic former bank building on Market Street in downtown Camden. The company already has 200 customers and is adding more, Tran said, noting its success has “changed everything” for him and his companies. Penji is becoming a main focus. With that success, the company has even offered graphics services to city-based non-profits for just $1 per month. Tran’s aim at Camden students and residents with an interest in tech came from the recognition that his own earlier companies, while anchored in Camden, had not hired city residents. Tran emigrated to the United States from Vietnam, settling in Camden, his family bootstrapping themselves upwards. Camden was part of his real-world education. “Providing opportunities for Camden residents and students was a natural step in retaining the talent, both to grow our business and shape Camden’s future,” Grzybowski said. 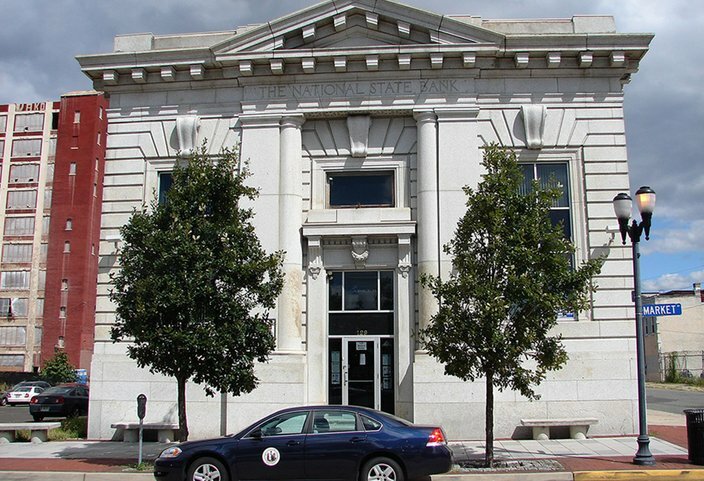 Their initial workspace, a repurposed bank building in the 100 block of Market Street in Camden’s downtown is booked out. The search is on for more space to grow. And that’s an “excellent” problem, Tran said.